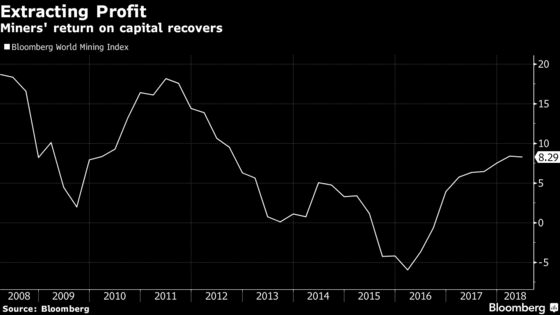 (Bloomberg) -- The world’s largest copper mine probably will avoid a repeat of last year’s prolonged strike as the two sides reign in expectations, according to a union leader. The main union at Escondida in Chile presented its demands to owner BHP Billiton Ltd. on Friday, and the company has until the weekend to deliver its counteroffer. The two sides are scheduled to sit down for talks next week with the current contract expiring on July 31. “If I was an investor, I would be betting on this being resolved quickly,” union spokesman Carlos Allendes said in an interview in Santiago on Wednesday. "Numbers show that, at the end of the day, a strike is no good for the company because they lost more than we did." BHP and its workers at Escondida failed to reach an agreement last year, leading to the longest mining strike in Chile’s modern history. In April, the two parties met again for early talks without reaching a deal. The union is betting the company is feeling pressure from shareholders and won’t be able to stomach another prolonged stoppage. BHP declined to comment. “During lean times we tightened our belts, and it’s taken us a long time to get back what we had," Allendes said. “Now we’re in different times, and we wouldn’t want under any circumstance to have to do it again." Workers want a 5 percent pay increase and the most generous one-time bonus ever paid in Chilean mining. But the union -- which represents about 2,500 operators and maintenance workers -- says the overall contract they want now is more modest than that presented in last year’s negotiations, and slightly lower than the one pitched in April. The union’s relatively conciliatory tone may ease concerns about risk of another strike, which has been rattling markets as the talks begin. Copper spot prices are near the smallest discount to the one-year contract since April 2017 as traders brace for possible supply disruptions. 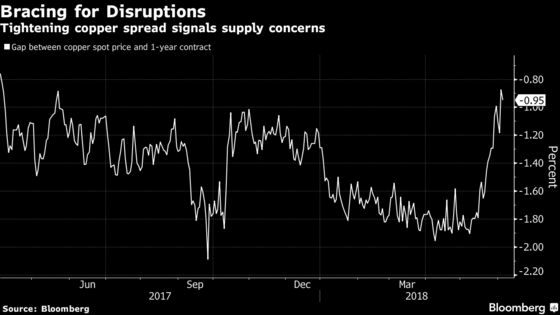 While the market looks better supplied this year than previously thought, chances of supply disruptions are still high, according to the latest Bloomberg Intelligence copper report. Negotiations still left to resolve -- including Escondida -- represent about 2.6 million tons of global copper supply, BI calculates.